Unfortunate but true, HR professionals and managers nationwide must deal with the horrific possibility of violence erupting in their own facilities. To help employers prevent tragedies like those that paralyzed communities across the country in the past several years, Business Management Daily has prepared a free toolkit offering business advice, guidelines and policies aimed at keeping workplaces safe from employee violence. Business Management Daily’s free Workplace Violence Prevention Toolkit contains prevention strategies, tips on identifying potentially violent workers, advice for managers on maintaining a safe workplace, two sample anti-violence policies adaptable for use in any company and checklists to use in case violence does erupt. An effective workplace violence prevention program starts with employee screening and ends with publicizing a tough anti-violence policy, according to Dennis A. Davis, a former SWAT team liaison who now directs client training for the employment law firm Ogletree Deakins. Your best chance to avoid workplace violence is to avoid letting in a violent person in the first place,” Davis says. Ask all applicants for personal as well as professional references. Insist on a face-to-face interview so managers can gauge an applicant’s temperament. Ask everyone who comes in contact with the applicant about their impressions. Then trust your gut. Does this person seem stable? “These people are your eyes and ears, your early warning system,” says Davis. They’ll probably know if someone is about to become violent long before anyone else does. When violence occurs at work, employees may say their violent co-worker “just snapped.” But, the truth is, people usually don’t snap. They display warning signs long before they actually act out. The key is to talk to employees early in this “pre-violence” stage to offer assistance and/ or let them know their behaviors are unacceptable. Substance abuse Research shows a big correlation between substance abuse and violence. Severe stress Stress is a function of modern society but people with a propensity toward violence allow that stress to become an excuse for violence. Decreased or inconsistent productivity Employees with a tendency toward violence have a harder time keeping a consistent level of productivity. Social isolation and poor peer relationships Loners are more likely to act violently because they don’t have a social network to work out problems. Poor personal hygiene These people have moved into the dangerous “I don’t care” phase. However, those results can be influenced. With proper crisis management methods and post-incident intervention, an organization can recover from and decrease the negative fallout from an incident. The following is a basic step-by-step crisis management guide to help you and your organization get back on track after a critical incident. First and foremost, be certain that all employees, customers, clients, and visitors have been removed from harm's way. Make sure that local law enforcement has been informed of the incident. Provide emergency medical care for any injured parties. If a threat remains, keep all personnel away from the site until it has been cleared by security or police. After an incident occurs, it is imperative to reinforce security precautions with all personnel. Frequently, an organization has adequate physical/site security, but the measures have been disregarded or disabled by employees—usually as a corner-cutting convenience. With the heightened awareness following a critical incident, your personnel will be more likely to hear and heed your warnings against these types of security breaches. As soon after the removal of the threat as possible, your HR director should schedule Critical Incident Stress Debriefings (CISD). CISDs are extremely important to the recovery of an organization following a critical incident. Information. This is where the employees are given as much information about the incident as possible. This helps to decrease the number of rumors and myths that follow many traumatic incidents. Venting and validation. During this phase of the CISD, the participants are encouraged to share their fears, concerns and other feelings. Once these emotions are expressed, they are validated. This serves to reduce anxiety in an organization and minimize the need to talk about the incident when employees should be working. Prediction and preparation. During this final of the CISD phase, the facilitator helps the employees understand what to expect next. Example: Who will be questioned during the police investigation? Research has suggested that a CISD following a critical/traumatic incident can drastically reduce the negative impact on employees. One of the most difficult invasions for most people is to have a microphone thrust in their face and asked to be instantly prophetic (coherent, intelligible, informed, etc.) following a critical incident. Don’t allow any of your employees to be put in this situation. If there is ever an incident in your organization that is of such magnitude that it generates media interest, it is essential that a company spokesperson be designated. If you have not already designated this person, do so immediately, before an incident can occur. Almost every household has a scrambled Rubik's Cube that has never ever been solved. Use the online Rubik's Cube solver to get it fixed in less than 25 steps! Ban weapons, and have a zero-tolerance policy regarding threats in the workplace. Screen carefully by checking references and doing criminal background checks. Train supervisors to recognize personality changes and warning signs. Defuse disputes. Establish a mediation program to resolve employee disputes rather than letting them simmer. Evaluate your security system at least once a year. Consider whether you might need silent alarms, ID keys, cameras or even an armed guard. Make it a policy that any restraining orders involving employees must be reported to management, and include this in your employee handbook. Train front-line employees. Receptionists and front-desk clerks should be on the lookout for unusual or unsettling encounters, and have clear instructions on how to handle and report them to minimize risk to themselves and others. Every employee should be instructed as to when and how to contact the police. Establish procedures for employees to report threats or other violent behavior. Offer several avenues for reporting: supervisors, security personnel, human resources, or if there’s imminent danger, everyone nearby. Document any threats and your response to them. Your zero-tolerance policy should dictate dismissal of an employee who makes a threat. If it’s a worker’s relative or friend who’s being disruptive and dangerous, you are within your legal rights to terminate the employee, provided you give him adequate warning. Assess how your company handles stress-inducing events. For example, what is your procedure when a law enforcement officer or process server comes to see an employee? Confrontations shouldn’t occur in view of other employees. You could instruct your receptionist to direct the officer to a private part of the office near an outside door, then quietly ask the employee involved to report to that area. Terminate with care. Have someone along as a witness if you have to terminate a violent employee; consider engaging backup security. Treat the worker with dignity, and allow a way for the person to depart quietly. Afterward, change the locks. 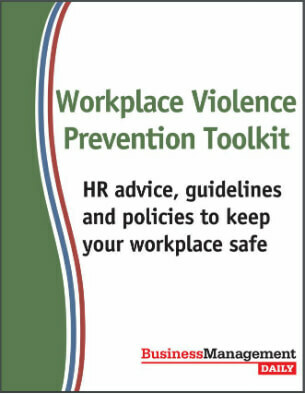 The Workplace Violence Prevention Toolkit contains lots of great resources for managers and HR professionals. Use this “Memo to Managers” article to educate your supervisors. Paste the content into an e-mail, company newsletter or other communication. Edit as desired. Use this list of online resources to help train your staff. Hundreds of articles like these—full of practical HR advice—are available to HR Specialist Premium Plus Online subscribers.